Scripophily is the study and collection of stocks and bonds. Some people refer to scripophily as a specialized field of numismatics. Scripophily is an interesting area of collecting due to both the inherent beauty of some historical documents as well as the interesting historical context of each document. Scripophily gained recognition as a hobby around 1970. The word “scripophily” was coined by combining words from English and Greek. The word “scrip” represents an ownership right and the word “philos” means to love. Today there are thousands of collectors worldwide in search of scarce, rare, and popular stocks and bonds. Many collectors like the historical significance of certificates. Dot com companies and scandals have been particularly popular. Railroads is another area widely collected. Others prefer the beauty of older stocks and bonds that were printed in various colors with fancy artwork and ornate engraving. A part of scripophily is the area of financial history. Over the years there have been millions of companies which needed to raise money for their business. In order to do so, the founders of these companies issued securities. Generally speaking, they either issued an equity security in the form of stock or a debt security in the form of a bond. However, there are many varieties of equity and debt instruments. A lot of companies were never successful or went bankrupt so that their certificates were worthless pieces of paper until the hobby of scripophily came along. An excellent guide for both the beginner and experienced collector is The Scripophily Guide by Howard Shakespeare which is a publication of International Bond and Share Society and can be downloaded here. 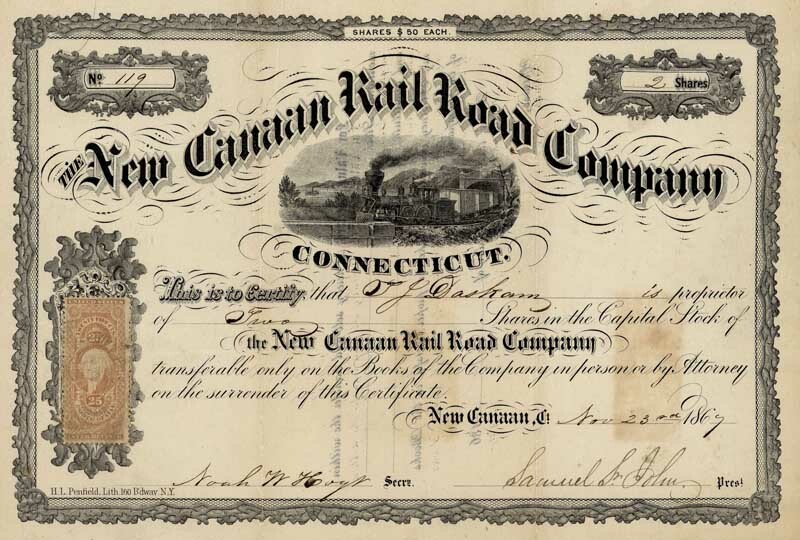 Another excellent reference for a novice is: Scripophily 101: Basic Information Every Collector of Old Stock Certificates Should Know by Paul Ramirez can be found here. The best way to begin is to learn about the hobby by talking with other collectors, dealers, auctioneers. Joining a society or club, like the IBSS, is also a good place to start. And, by all means, read whatever you can be it books or magazines or old auction catalogs. With a base of knowledge you can decide how and what you want to collect. 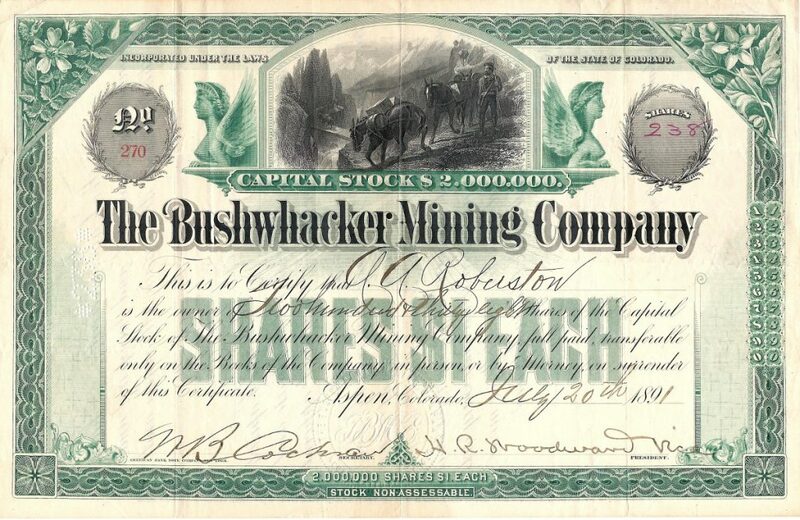 Many collectors favor themes such as railways, autos or mining or even further defined such as railways of the state of Connecticut or mining companies of Australia. Some collectors base their collection on the printer of the certificate such as American Bank Note Company or Bradbury-Wilkinson. Some collect certificates associated with well known business people such as the Rothschilds, J.P. Morgan, Rockefeller, Vanderbilt or Gould. You could collect bonds of high denomination or single share certificates. The theme you ultimately choose can be just about anything! Bonds are issued, not only by businesses, but also by national, state or city governments, or other public bodies, or sometimes by individuals. Bonds are a loan to a company or other body; they are normally repayable within a stated period. Before repayment bonds can be traded or sold to other interested parties. Bonds earn interest at a fixed rate, which must usually be paid by the undertaking regardless of its financial results. Shares are issued by businesses (usually companies). Shares form part of the permanent finance of a business. Normally, they are never repaid, and the investor can recover his money by selling to another investor. Many shares earn dividends, depending on how well the business is performing. A shareholder is a part-owner of the business. Where can I buy bonds and stock certificates? How is the value of a bond or share determined? Like anything else, the value is what someone is willing to pay. Prices of certificates can vary from a few cents to thousands of Euros or Dollars. Here are some of the things collectors define as important in determining value. Decorative quality – many collectors just plain like they way the look and many collectors frame and display their collection in their home or office. The vignette or illustration on a certificate goes a long way in determining its decorative value. 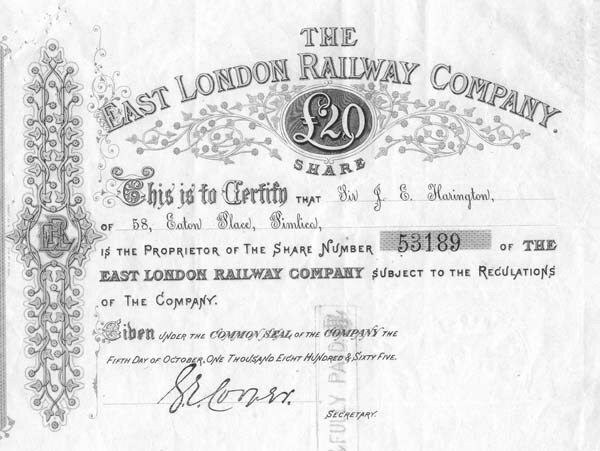 Historical importance – many certificates were issued to finance events of importance by companies of significance in their field. Many collectors feel bonds of the Confederate State of America or by the English South Sea Company to be historically important. Early railroads or early manufacturers of automobiles and aircraft are also considered historically important. Autographs – The original signature of a famous person on a certificate generally enhances the value but collectors should be aware that many signatures are printed in facsimile, and others may be signed by clerks on behalf of their employers. Age – usually older certificates are more sought after than newer certificates. What is the International Bond & Share Society? The International Bond & Share Society (IBSS for short) is an association of people interested in scripophily. The society was founded in 1978 as a non-profit organization with the aim to promote, encourage and develop all aspects of scripophily. The IBSS has members all over the world and is funded exclusively by the members. The society publishes Scripophily three times a year (for a sample issue press here) and also conducts auctions for members to consign items as well as bid on new certificates for their collections.